Birthdays, losing more than the plot, and news from the social media. All this, and 8 pieces of music… and we don’t charge you a penny! 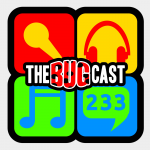 The next show will be episode 234 – broadcast live in the chatroom on Friday 26 October from 21:30 UK time.